NYC, 04/15/2019, 2:00PM. Valley of the Kings (1954): Searching The Tomb Of An Egyptian Prince. 86 min. Director: Robert Pirosh. Starring Robert Taylor, Eleanor Parker, Carlos Thompson. The screenplay by Robert Pirosh and Karl Tunberg was "suggested by historical data" in the book Gods, Graves and Scholars by C. W. Ceram. 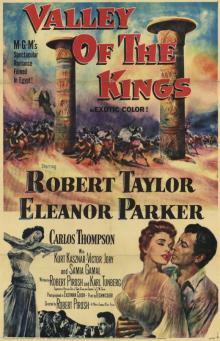 The film's world premiere took place simultaneously on 21 July 1954 in Cairo and Alexandria (as well as New York City). It marked the first time an American film had a world premiere in Egypt.